Propagation of a particular interpretation of Islam cannot be the purpose and objective of AMU. The Wire's senior editor, Arfa Khanum Sherwani, at the recent Women Leadership Summit at Aligarh Muslim University. How should someone who regards himself as a friend of the Aligarh Muslim University react to the recent happening at the campus? It has not been reported in the media, so should one treat it as an internal affair of the university? If one is a well-wisher – not an insider, neither a teacher nor a student – does one still have the right or locus standi to comment? I am talking about the recent Women Leadership Summit at the university. It was held partly at the main campus and partly in the women’s college. It was not the decision of the organisers to do it at both places – they were forced to shift to the safe confines of the women’s college after a group of students led by the vice-president of the students’ union (AMUSU) created a ruckus and dismantled the pandal erected on the lawns near the Kennedy hall. When I heard about the vandalism, my mind went to the sunny lawns where I have shared my thoughts with the AMU community on at least three different occasions. I have been questioned, disagreement has been expressed and I have been heard patiently and even indulgently. But the occasions were different and safer. First because they were organised either by the AMUSU, which is largely a men’s body, or some other body of the university. This time was different – the women’s students’ union was the organiser. That they wanted to move out of the safety of the women’s college also shows that they wanted to lay their claim to the university. Yes, they are students of the women’s college, but they are an equal part of the AMU. They have, therefore, an equal right over it. Was this the cause of the protestors’ annoyance? One can only guess, for they have not said so explicitly. The list of speakers was impressive and should have won the approval of the AMU community. But no! There was a problem with one of the speakers, journalist and The Wire‘s senior editor, Arfa Khanum Sherwani. The protesters wanted her to be disinvited. The charge against her: she had insulted Islam by posting a photograph of herself with the lines from the old Sufi Bulle Shah, “Holi khelungi kah Bismillah!” Bismillah should not have been here, was the argument. It was a misuse of the holy invocation, even if not an insult to the religion. How can Bismillah and Holi – which is not an Islamic practice – go together? Was she trying to tease the pious Muslims who kept away from Holi by mixing an Islamic saying with a non-Islamic practice? Was it not a minor form of blasphemy? When pointed out that the lines were not penned by her but by the grand old Sufi poet, another objection emerged. No, it was not actually this post but a different one in which she had expressed her discomfort with A.R. Rahman’s daughter’s decision to cover her face. She said that she found no basis for this in the Quran. It was deemed an insult to Islam, and an apology was sought from her. So, the organisers thought it wise to move the event to the women’s college. The university administration had done nothing to secure the space for them. For the organisers, it was important that the programme was held in its entirety. It was not prudent to sacrifice the whole event at the altar of the ego of some male students. 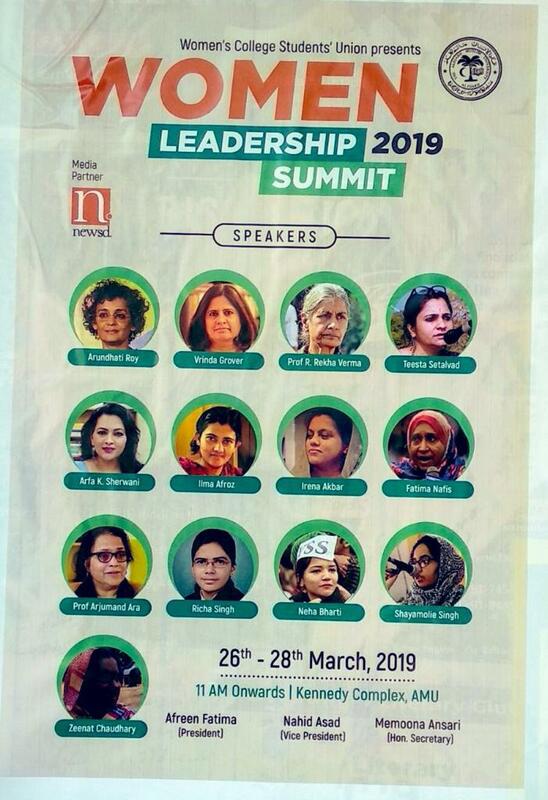 Poster issued by the WCSU for the Women Leadership Summit 2019. Sherwani, who was prevented from making an appearance on the lawns, finally spoke. She was heard and questions were also addressed to her. Everything happened in a civilised manner as it should anywhere, more so on a university campus. The women organisers thus deftly also deprived the mainstream media of a salacious news item, about Muslim men taking away space from women. One also needs to note that the majority of AMU students were not opposed to the event. That a small group managed to force the women out of the main campus is a sad commentary on the administration. That it did not want to enforce order is an admission of its hidden desire to somehow scuttle the event. One also needs to understand why the silent majority is paralysed once religion is invoked. That the organisers did not go for false bravado and martyrdom, and saved the event, is something unexpected. Sherwani was also condemned for being “too secular”. I was intrigued by this category. Does one mean that that being too secular is being anti-religion? What does being anti-religion mean? Is one allowed to question a part of the practice known by that religion or not? Who has the sole claim over the interpretation of religion? ‘Secularism up to this point and no further!’ Is this what the protesters want to say? Secularism can be defined and explained in many ways. As statecraft, it has a meaning – but the way France and Quebec define it differs from the Indian way. Similarly, when it is discussed as a social habit or practice, it can mean different things to different people. Atheists can be secular but intolerant, anti-liberal and even tyrants, as we can see in the case of China or in the earlier case of Kemal Pasha. People can also be religious, tolerant and open to different ways of living at the same time. 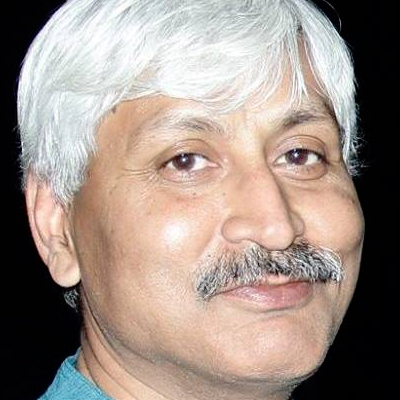 If Hindus are told that the acceptance of the primacy of Ram is the first condition for being a Hindu, or when Muslims are told that not questioning the practice of purdah is fundamental to being a Muslim, it is clear that it is only one version which is trying to establish its hegemony. Secularism, one must argue, comes with the recognition of an individual’s right to have her view about anything and everything. A communitarian dominance over individuals is antithetical to the flourishing of secularism as an idea and as a social practice. Second, it requires humility and a recognition of the partiality of one’s vision. One can hold that her religion is supreme but at the same time realise that she is a limited mortal human and there are other humans who have been created by the same force which created her. They have all the right to have their views. The acceptance of the inadequacy of one’s position and the desire to address it demands a constant dialogue with people who have a different view. Secularism cannot in its true spirit exist without this liberal stand. It is a package. Protection of minority rights is a vital part of it, but safeguarding the right of criticism and freedom of thought and expression is also essential for it to survive as a meaningful concept. Otherwise, it becomes a mockery of itself. After all, why is secularism better than other ways of life? Because it fundamentally means freedom. Freedom of communities and at the same time freedom of individuals. One does not intend to have a debate on the issue of purdah. Sherwani was trying to question one interpretation of it. As it happens, the nuance of her position was lost in the din. But then that is a different debate. Presently, the concern of the writer is whether one has right to discuss it or not. I would personally defend a woman’s right to observe purdah, but in the same breath also stand for another voice which wonders about it. Even more important than all this, especially in this context, is to understand that a university, even when it is minority institution, is not a place to propagate religion. Propagation of a particular interpretation of Islam cannot be the purpose and objective of AMU. It must welcome diverse views, invite critical voices, inculcate the habit of patience to cope with differences and opposition to one’s belief, and help one develop the ability to scrutinise all axioms. Otherwise, it is not a university. The women’s students’ union, by pulling off the event, has proved to be a worthy bearer of the idea of a university.